If you take walnuts, almonds and hazelnuts on a regular basis and in certain quantities, they can be quite healthy. However, it is worth mentioning that when you eat too many nuts, it can actually harm your health. 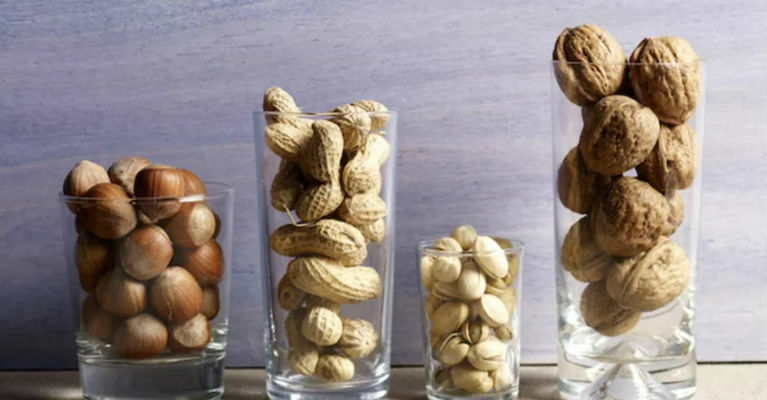 According to many nutritionists, almost every type of nuts comes with a certain amount of good fats that are able to reduce the chances of developing heart disease and stroke. Every type of nut has its own nutritional benefits and while some of them are richer in vitamins other are packed with more omega fatty acids. As we already mentioned, one must be careful with the amount of nuts they take. So, what is the right amount? The same nutritionists claim that a handful of these nuts is the ideal amount. In other words, we should not consume more than 8 almonds, 6 cashew nuts and 3 walnuts. When it comes to seeds, one teaspoon a day is enough. Eating too many walnuts, almonds and hazelnuts can result in a feeling of bloating. The main reason why this situation occurs is the presence of tannin and phytate – these substances are very difficult to digest. If you want to avoid these problems stick to the recommendations. Nuts are part of many diets, but they are always recommended as snacks and taking no more than a handful. If you take more, nuts will produce counter effects – you will gain weight. Nuts are very healthy, but they are also very caloric. As a direct result of taking more than the recommended quantity of these snacks, you can experience selenium poisoning. The symptoms of this poisoning are visible clearly – the hair and nails will lose their quality and you can also experience joint pain and sore muscles. Keep in mind that selenium poisoning is very rare, but this is just a warning to be more careful.